Published in the South Kent Gazette, 25 July, 1979. This is all that can be said about the history of the venerable church from its erection by the Prebends of St. Martin, soon after the Conquest, until the year 1536, when it was sealed up by order of Henry VIII, who, shortly afterwards, in response to a petition of the inhabitants, gave it to them as their place of worship. From that time until 1871, the parishioners retained and exercised the right of electing their minister, the last one chosen in that way, after a two days’ poll, being the Rev. John Puckle, M.A., in the year 1842. On October, 1871, at a meeting presided over by Dr. Tait, Archbishop of Canterbury, the parishioners resolved to hand over their right to select their minister to a Trust composed of the Archbishop of Canterbury, the Lord Warden of the Cinque Ports, and the Lord Lieutenant of Kent for the time being. This Trust made the appointments of the Rev. A. L. Palmes, on the death of Canon Puckle, in 1894; the Rev. Canon H. Bartram, on the removal of Mr. Palmes to Saltwood, in 1901; and, upon his retirement in 1912, of the Rev. (later Canon) W. G. Elnor. On (this occasion it was announced that the appointment had been made by the Archbishop of Canterbury acting for the Trustees of the living. Though polling for the minister ceased as long ago as 1842, there was a poll for a churchwarden-ship as late as 1912, voting taking place in the then recently opened Parish Hall. It was the custom in Dover for many centuries to hold the elections of the Mayor and the Members of Parliament in churches. The Church of St. Peter was used for that purpose until it fell into ruin in the early days of Elizabeth, and after 1585, those elections regularly took place in St. Mary’s Church until 1826, when the practice was abolished by a local Act of Parliament. An unusual addition to features of the church, in 1889, was a wall painting, carried out by a Dutch artist, depicting the Wise Men presenting their gifts to the Infant Jesus. A war memorial to Dover men who fell in the South African war, 1899-1901, in the form of an alabaster slab, is in the chancel of St. Mary’s Church, where it was unveiled by Lord Roberts on April 19th, 1912. In the east end of the north aisle is a chapel to the memory of the late Rev. T. S. Frampton, which was dedicated on the 6th January, 1928. St. Mary’s old parish hall was built on the site of an old bowling green, at the rear of Biggin Street and was opened in February, 1912, by Mrs. Brenchley. There is absolutely no record as to how the church grew to its present fair dimensions. In the Middle Ages, pious persons, no doubt, gave of their wealth to enlarge it. The features of the added work, both in the tower and the eastward extension, indicate that the enlargement took place in the 13th and 14th Centuries, but as a matter of record there is no available history of this fabric further back than the close of the 16th Century, and even that is so fragmentary that it conveys no idea of what the edifice was like when the parishioners became its possessors. The Rev. John Puckle, who was minister of this church for more than fifty years, and who was mainly instrumental in its re-building in 1843, has left on record in Volume 20, “Archaeologia Cantiana,“ his idea of what the ancient fabric was like, but he supplies only inferences from remaining architectural features. St. Mary’s Church — minus its tower, which the artist unfortunately omitted—before the main part of the structure was pulled down and rebuilt in 1843. With the exception of the tower, the whole of the church was re-built in 1843, even the ancient round pillars and semi-circular arches at the west end of the nave were taken down, their several parts being numbered and re-erected as before. The tower front, enriched with narrow arches and scale work, similar in feature to Ely Cathedral, was restored in 1898; the tower itself has never been re-built, but it was built at different periods. The lower portion, having an arched doorway corresponding with the most ancient part of the interior, was it is presumed, roofed over, forming the porch of the early Norman church. Upon that porch was built, at a later date, the present tower, with its ornate front, which has been much admired for centuries. In addition to the alteration of the tower in 1898, there was an earlier restoration in 1874, when woodwork which had concealed the arch at the west doorway was removed. On the south side of this tower is a sun-dial, erected in 1656, and a clock on the west front. There was a clock and chimes in 1680. Mr. Peter Monins, Mayor, gave the clock and chimes erected in 1736. It was then placed on the fourth stage of the tower on a slab which hid some architectural feature of the tower. The present clock was made in 1866 by Mr. John Bacon, of Dover, its cost being defrayed by public subscriptions and, when the clock was re-erected after the restoration of the tower in 1898, it was brought a stage lower, with a less disfiguring effect. The north porch was built in 1891, and an approach made from Dieu Stone Lane to the previously but little used north door. 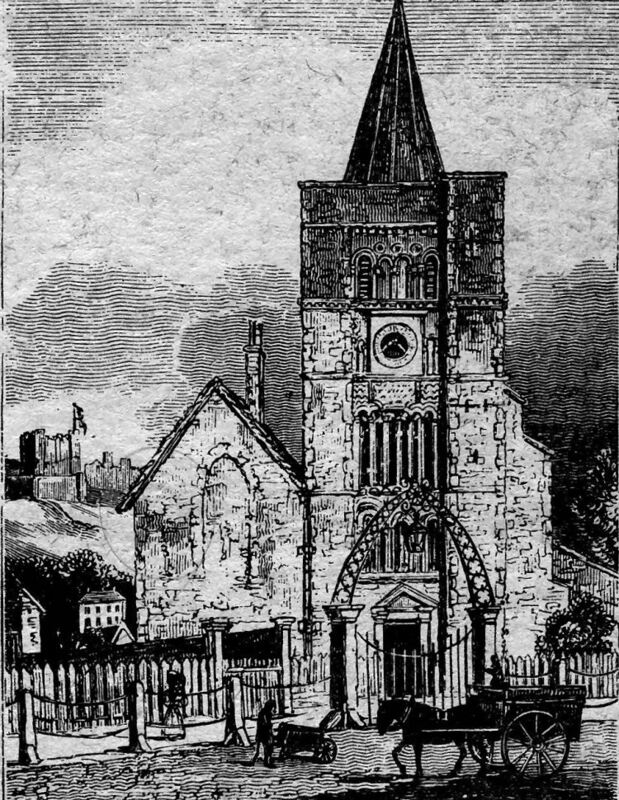 The church is shown after re-building, in a print of 1859. Old Cannon Street, apart from the church, had two special features—the collonade which on the east side fronted Mr. Standen’s upholstery premises, adjoining the south side of the churchyard, and the “Royal Oak“ Hotel, which for many years stood opposite the church tower. It is believed that the “Royal Oak“ had existed there since the Stuart days, and that it was named after the oak in which Charles II hid himself. These features disappeared in the widening of Cannon Street in 1893. 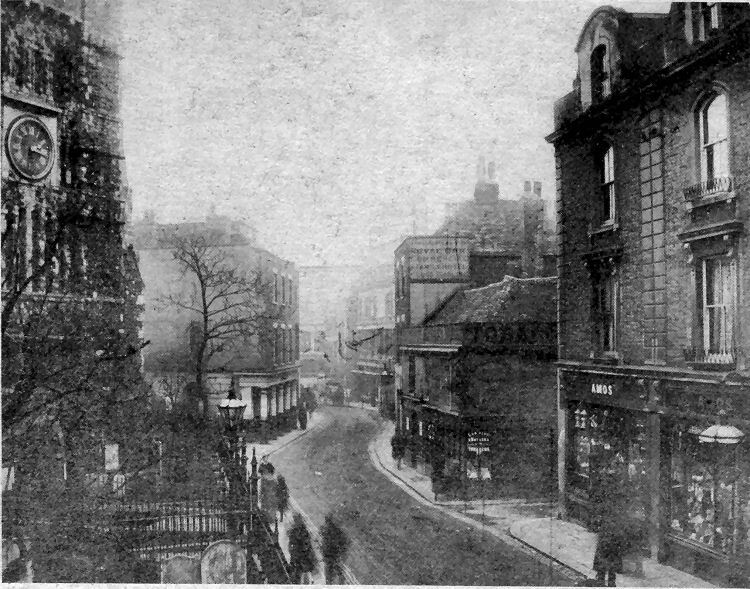 Prior to that date the street was both crooked and narrow, and in earlier days it had been narrower still, the footway on the east side previous to the rebuilding of the church in 1843 having passed over a part of the churchyard, and after the rebuilding that part was permanently added to the street. The Royal Oak Rooms, at the back of the “Royal Oak Inn,“ Cannon Street, were used for many years for public meetings, balls and banquets. The Dover Corn Market, also, was held there, and the “Royal Oak“ yard was the “putting-up“ place of coaches, omnibuses and carriers’ vans—a rendezvous for country folk such as no longer exists in Dover. The Deal coaches made the “Royal Oak“ yard their terminus until they ceased to run on the opening of the Dover and Deal Railway in 1881. The widening of Cannon Street is an important part of its history. There was a widening in 1858, when the frontages which used to stand between New Street and the “Royal Oak“ were set back. On that occasion, although the frontages were down, and the land in the hands of the Corporation, they only took sufficient off to put the houses in line with narrow Biggin Street. PARKED CABS and delivery vehicles cause considerable congestion today in Dover’s main street—particularly in Cannon Street. And it was no different during the latter part of the last century when this photograph was taken outside St. Mary’s Church. Horse-drawn coaches, horse-drawn buses, delivery wagons and handcarts going about their business would often reduce traffic, such as there was, to one lane or block the road completely. As John Bavington-Jones wrote, prior to the widening of 1893 — when the whole of the business premises on the right, with a collonade in front, were demolished — Cannon Street was both crooked and narrow and, in earlier days it had been even narrower. Opposite the church is the old "Royal Oak Hotel" believed to date from Stuart days. The Royal Oak rooms to the rear of the old hostelry were used for many years for public meetings, balls and banquets, and the Corn Market was often held there. Its yard, too, was a hive of industry, being the rendezvous for coaches, buses and carriers’ vans bringing country folk into town for miles around, particularly on market days.